Here's a demo version of my upcomming mod. Last edited by Dr.Colossus on Thu Mar 15, 2018 11:29, edited 3 times in total. Wait, shouldn't this go in the release forum? I forget. oh wow. the titlescreen is DOPE! I adore all off your titlescreens but this time around the Vorticon Mothership is outstanding! splendid! side note: it's hilarious how Keen strays around in the in-game demo. made me grin a lot. Indeed that is an awesome title screen! So is this preview-demo, didn't think you'd yet be able to both stand on the Cola cans and Robots. Sorry, mixed up my mods and wrote the wrong headline. Thanks for the positive feedback. There is still a lot of work to do. Especially background stuff. If i keep it I would ask him for his permission and give credit. If you want you can draw some background stuff that fits to the level themes, or images for the story screens, or improve the sprites. All help is welcome. Oh man, would you guys please stop crushing it all the time?! *cries* This looks so damn good. Your interpretation is great. I really like your tilework, all those slightly raised parts of the platforms giving more sense of depth, etc. And oh yeah, that title's awesome. I tried out the 6 levels that were contained within, and I thought it was quite entertaining. I loved how the graphics looked (especially that title screen), and how you managed to transit the levels into Galaxy-style. Seeing the demos not being changed had some humorous results (not saying that it's a bad thing). Looking forward to seeing the complete version. Oh, and by the way, I think you forgot to get rid of that Keen5 executable in the download folder before releasing it. Might be a good idea to remove it. EDIT: Oh, I almost forgot one problem I found! The Guard Robot in level 3 can't seem to get out of the vertical tube, so I had to use God Mode to get through it. Looking cool! 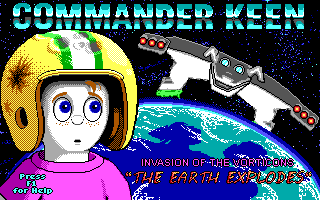 I too really like the Mothership looming over earth in the title screen! I also really like the many platform and background graphics you've incorporated into the mother ship (except the prominent green and blue background, feels a little out of place and glaring for the ship and in such a huge area), they look great! I was really surprised at how simple but well done the world map was, great transition in style from vorticones to galaxy. The level design is a great interpretation of the original levels in the galaxy style. The one thing I'm not a fan of is, which really is just my preference, is the the burly muscular vorticons. I know. There is still a lot of patching work to to. This is only a minor problem to fix. But the wall-climbing robots are giving me headaches. Yes. I even wasn't satisfied with the design. Zilem posted me her design suggestions and they are a bazillion times better. Fantastic quality of this remake....really....wow. The titlescreen is amazing! I have seen a review of this mod on a german keen youtube channel and I got pretty excited about this one. I like the new and fresh colors! Its amazing how many mods are in production lately! It seems the one-way-up tiles shatter Keen's shots, this will need to be worked on. (I'm wondering if the 'cradle' property will work better.) A very nifty demonstration that also shows the work that needs to be done. One thingh though as I noticed that this was referred as "demo" - is it finished or still in progress? It's only an early alpha demo. I'm still working on it.